The 3-star Hotel Sahib in Cattolica is located in a quiet and peaceful area, ideal for those looking for a restful stay. It is just a few steps from the sea and offers free WI-FI, air conditioning and two playground areas for children. Admits animals of small and medium size. The hotel is located in the north of Cattolica, about 2 minutes walk from the sea and close to the Aquarium (about 5 minutes walk). Its location, quiet and with little traffic, allows you to reach the center in less than 15 minutes with a walk through the promenade. All rooms have balconies, individually controlled air conditioning, free WI-FI, 24-inch satellite TV and digital terrestrial, safe and bathroom with hairdryer. BASIC : Bright and simply furnished. It has a bathroom with an open shower. COMFORT : Available for couples and families, in addition to basic services, they have renovated bathrooms with shower and hairdryer. NEMO : themed rooms ideal for families with children with a maritime-themed decor and cartoons. It is available for 4/5 people and in addition to basic services, it includes numerous additional benefits such as beach towels, minibar and much more. Garden, two playground areas for children (outdoor and indoor), free bicycles and lift. The staff organizes theme nights. PARKING : uncovered and guarded 24 hours, located 300 meters from the hotel with shuttle service available. CONVENTIONS : beach, amusement parks, discos and gym. BREAKFAST : international buffet breakfast with sweet and savory choices, including cakes, croissants, cereals, fruit juices, cold cuts and cheeses. LUNCH AND DINNER : 3 choice menu based on meat and fish, with recipes of local cuisine and homemade pasta and desserts. The dishes are followed by a buffet of vegetables, salads and hors d'oeuvres. VARIATIONS : the menu is suitable for vegetarians and on request the staff prepares gluten-free dishes for coeliacs (it is advisable to point out the special needs when booking). In the hotel : two playground areas (indoor and outdoor) with castles, slides, swings and table football. Bicycles equipped with child seats and bicycles. Baby sitter and pediatrician services are available on request. In the room : cots without extra charge, bath tubs and anti-fall rails. At meals : seats at the table, crockery (saucers, glasses and cutlery), bottle warmers, baby food and baby menu. Every day the chef prepares vegetables and vegetable broths. On the beach : entertainment service, playground with mini club and many activities, including creative workshops, competitions and treasure hunts. 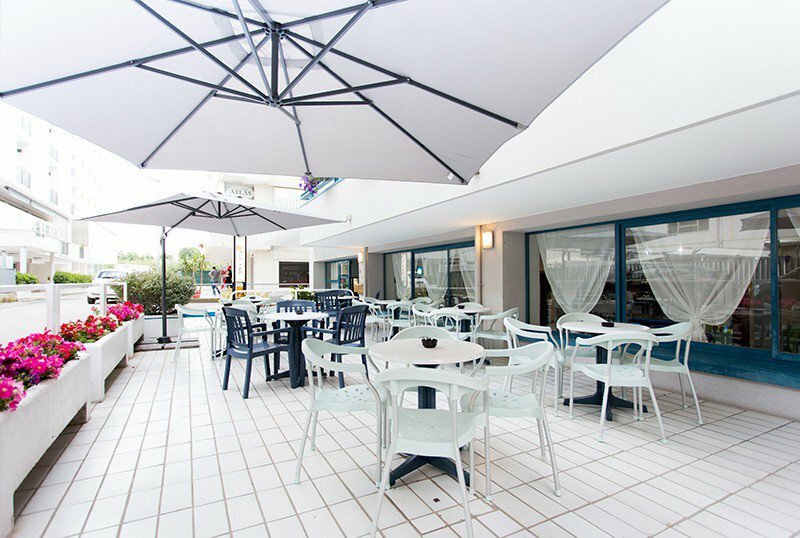 The hotel has an agreement with the Altamarea Beach Village, with swimming pool, hot tubs, a children's pool, mini club, playground area, disabled facilities, sports fields, gym, free WI-FI, entertainment evenings and lots of entertainment for both adults and children. At the establishment there is Bau Beach: an area equipped for small and medium-sized dogs. FREE child up to 12 years for stays up to 16 June and from 25 August. 2 children from 3 to 12 years in the same room will pay as 1 adult only. 1 child free up to 12 years. In June we offer two different packages with special rates! 1 child FREE up to 12 years in room with 2 adults up to 15/06.